Weight loss after breaking your jaw is common. The surgery to fix this fracture requires wiring of the jaw, and for approximately three to six weeks after surgery you will have limited movement of your mouth and jaw to allow healing. With reduced chewing ability, eating can be difficult, and your meals will be made up of liquids or pureed foods. To gain weight, you will need to eat small, frequent, nutrient-dense meals. Determining your nutritional needs is necessary to figure out calorie and protein goals for weight gain. Calorie requirements are based on physical activity, gender and age. The average, moderately active adult woman should consume approximately 2,000 calories per day, while moderately active, adult men should aim for 2,400 to 2,600 daily calories. For adult men and women over age 31, the Dietary Reference Intake is 0.66 grams of protein per kilogram of weight daily. To determine protein needs, divide your weight in pounds by 2.2 kilograms. This number should then be multiplied by 0.66 to find your daily protein goal. Keep track of your intake. Eating more than your estimated calorie and protein requirements will encourage weight gain. Liquid intake after surgery is crucial in making sure you are getting enough nutrition to gain weight. Try to drink at least six to eight cups of fluids per day. While some of this fluid can be water, you should also be consuming high-calorie liquids such as nutritional supplements, juice, yogurt smoothies, milk and milkshakes. Cooked cereals such as oatmeal and cream of wheat can also be included as long as they are able to pass through a straw. Protein powder can be added to beverages for an additional boost of protein. Pureed foods can also be consumed by someone with a wired jaw as long as the foods are blenderized to a consistency that can be sipped through a straw. Soft, moist beef, chicken or fish can be pureed with gravy or broth. Milk- or cheese-based soups with soft vegetables can be blended. Well-cooked noodles or rice can be mixed with gravy or sauce. 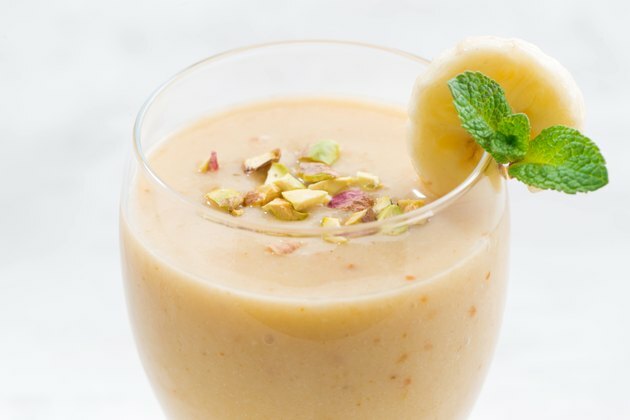 Ripe fruits such as bananas, peaches and mangoes can be pureed and then eaten alone or in a smoothie. Steam carrots, potatoes and cauliflower and combine them with a cheese sauce or liquid butter for additional calories. Avoid foods with skins, peels, bones or nuts. Preparing meals early and eating every two to three hours will help you with the goal of weight gain. If you can't eat enough with this plan, decrease the time between meals. Also, be cautious when sipping warm meals. Checking the temperature of the food before you eat can prevent you from experiencing further oral discomfort. A multivitamin is important to help with healing. Check the label of your nutritional supplements, and if vitamins and minerals are not added, check with your doctor about the need to add a liquid multivitamin. Finally, mouth health should be considered during the healing process. Rinsing with saltwater after each meal will wash away food residue from your teeth and gums.